Most resorts received about 2-4″ of new snow this morning and have remained cloudy throughout the day with some lingering showers. Another round of snow (with snow levels reaching to valley floors) will impact northern Utah overnight tonight and into midday Saturday. Expect relatively calmer conditions for the Sunday, with potential for a more impactful system early next week. Cold and unsettled weather look to remain in place for the rest of the December. 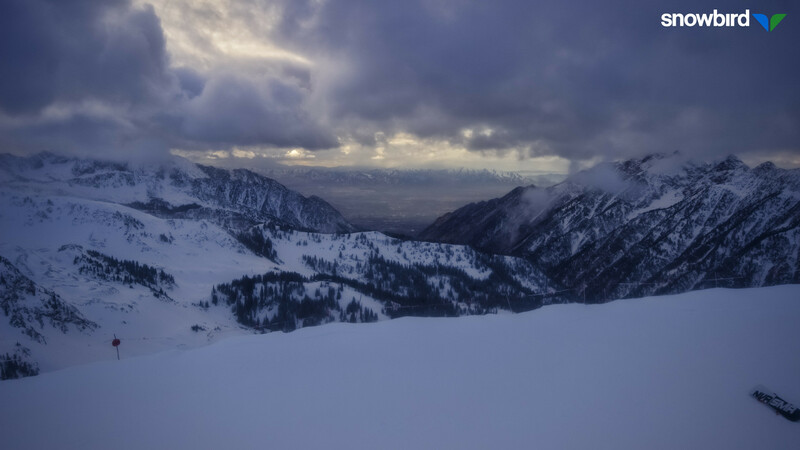 As the shortest day of the year winds down, the current webcam view from atop Snowbird’s Hidden Peak shows some clearing out over the Salt LAke Valley after this morning’s shortwave trough dropped a few inches of snow across the Wasatch mountains. View from Hidden Peak at Snowbird late this afternoon. Current view and 24-hour timelapses are available from http://prismcam.com/demos/snowbird-peaks/. Another shortwave trough will move across the region tonight with potential for additional snow accumulations into Saturday. It appears to be a bit colder than the one today, which will bring snow levels down to valley floors overnight. An area of vertical ascent is working its way into northwestern Utah at this time and current radar imagery shows snow across northwestern Utah/northeastern Nevada accompanied with this. Some snow has already started in the far northern parts of Utah’s Wasatch. The associated cold front looks to cross through the Salt Lake City area around midnight tonight. Ensembles seem to still have a fair amount of possibilities for this system in terms of snowfall. This morning’s downscaled NAEFS (12Z) on weather.utah.edu has precipitation amounts from about 0.1″ to 0.6″ with a couple outliers above that. Downscaled SREF members have similar ranges. This translates to anywhere between 2-12″ of snow. Most of the ensemble members are in the range of about 4-8″ in the upper Cottonwood Canyons for this system, which is close to the 3-7″ forecast by the National Weather Service for Snowbird overnight. For other locations, I think it’s reasonable to expect about 2-5″ for Park City Resorts, and 3-6″ for areas such as Snowbasin and Powder Mountain. Overall, tomorrow should be a fun but cold and blustery day wherever you choose to ski! This system will move out of the area quickly with slightly warmer and drier air moving in on Sunday, but windy conditions will also stick around through Sunday. Odds still seem to be in our favor for an extended period of unsettled weather beginning around Christmas Eve day until about the end of 2018. NAEFS plumes from 12Z this morning below show a stormy period possibly beginning around December 24 with big snow possible (but there’s still lots of uncertainty in exact amounts and tracks of systems) as we head into next week. On this graphic, you can also see the range of possibilities mentioned above for tonight’s snow event (look between 0Z-12Z on Dec 22). This morning’s NAEFS plumes from weather.utah.edu. It appears like we are in for a snowy rest of 2018! Snow tonight, and more snow likely the week of Christmas. Along with the storminess we should expect cold weather for the rest of 2018. It’ll be a nice way to wrap up the year! Have an enjoyable weekend and start to the Christmas holiday, and make sure to keep checking our daily posts for updates on what to expect next week!